25 Comments to "Margaret Thatcher, RIP"
This is self-evident to everyone who saw it happen. In America, however, almost no one believes it. In a similar vein, years ago I was surprised to find out that many Indians (perhaps most?) believe that India somehow won her independence in 1947 instead of simply having been left by the British for wholly internal British reasons. Many Africans believe that their countries won independence through their own efforts in the 1960s. Perhaps there are people in Central Asia now who think that their countries achieved independence as a result of some sort of a struggle. It’s funny. It resembles the sort of stories people tell themselves after breakups and divorces – utter delusion. It’s like an argument about who left whom, but it’s also like religious belief. 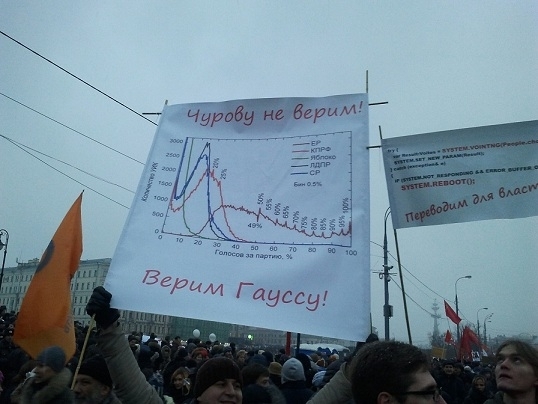 “The storm has passed because we prayed and fasted.” People crave agency. I agree. She wanted to “roll back socialism.” When she came into office, state spending took up 43% of GDP. By the time she left, that figure was down to…42%. Not exactly a radical change. * Launched a massive deregulation of banking and the financialization of the British economy, abandoning any significant ambition for the “real economy.” GDP eventually increased 10% during and after Thatcher to converge again with normal European levels. * An amoral (or simply immoral?) Cold Warrior foreign policy, including support for Augusto Pinochet, Apartheid South Africa, Suharto and Saddam Hussein. Later switched to opposing Iraq’s invasion of Kuwait and support for the 2003 Iraq War. * Opposition to the emerging Franco-German centralization of the EU (failed, but set seeds for UK to stay out). Opposition to German Reunification. * Brilliant victory in the Falklands. By these measures, IMHO, she can be classified as a class warrior fighting for the rich against the poor, working and middle classes. She confirmed the trend of the British people – perhaps inevitable – towards American-style decadence and social decay. She broke the organized British proletariat and replaced it with a low-payed, services-based and underqualified precariat. As in a America, its only real virtues are its political submissiveness and its flexibility. I’m going to be a bit impressionistic here, anecdotal, but I feel the “lumpen” culture is very strong in the UK: rise in obesity, in binge drinking, educational underperformance, and just general trashiness. She can be very rightly criticized for contributing to this. But I am always a bit stunned at the scale of hatred for her from certain quarters. http://www.redpepper.org.uk/five-songs-for-the-thatcher-funeral-party/ You’d think she’d committed genocide against the British people on the scale of a Cromwell or Stalin. Central Europeans show less hatred for the Communists than many Brits show for Thatcher. That said, if you’re Scottish, Catholic Irish or working class, simply put Thatcher considered you the enemy treated you as such (such as the amazing poll tax fiasco, first experimented upon Tory-no-man’s-land Scotland). Thatcher’s “positive” economic policy was firmly establishing the City as a global financial sector. Apparently the British State would not survive without tax revenue from it. Overall GDP has increased about 10% since Thatcher, bringing the UK back to normal European levels. But I’m not convinced the bankster-based faux-economy is really a viable or desirable model. I’m pretty sure it’s in the “decadent” category. The UK’s chronic trade deficits (the biggest in Europe) and the difficulties of its economy today, despite having its own currency, I think are attributable to the weakness of this economic model built by Thatcher and confirmed by her successors. The significance of her foreign policy, I think, is always extraordinarily exaggerated, especially by her admirers. Her influence on Eastern Europe is of course grossly overstated and your quote is very apt and funny. But besides the Falklands, *it’s not clear to me what she actually did*. She did not materially support Reagan’s Cold War crusades in Angola and Nicaragua. She supported installing Euromissiles in Europe, but then so did Mitterrand and Kohl. The bit I find most personally distasteful, on foreign policy, is her incredible Americanophilia. She set the British pattern for total, enthusiastic alignment with Washington, *without ever getting anything in return*. Reagan and Bush did not support Britain in the Falklands or on German Reunification (I am sure I am forgetting other cases). It’s simply reflexive, Pavlovian, sincere, the purest expression of the British ruling class’ utter and extreme psychological dependence on America. To give credit where credit is due, she saw the problems of an unreal and vague push towards European unity and particularly the common currency. Her completely legitimate summit fights to get a British rebate and the 1988 Bruges speech effectively forged the modern British eurosceptic movement. The UK is a better place for this today, had it joined in the euro-fun all the indicators suggest it would be a GIIPS, snuggled between Italy and Spain, with its sovereignty violated by a “bailout” or with the simple imposition of a Monti-style commissar (Neil Kinnock?). All in all, I conclude, Thatcher rode the wave and accentuated the trend of British decadence. She was a softer Reagan, with the same move towards an unreal economy and an aggressive (probably compensatory) “confidence” and national self-satisfaction that overlooked both countries’ very real and worsening decay. I find it interesting that, in different ways, political elites in both the US/UK and Continental Europe began brutalizing their middle-lower classes economically and began to lose touch with reality in the 1980s and 1990s. No doubt there are some common sociological factors to this. "I think both sides overstate her real significance"
I agree. She wanted to "roll back socialism." When she came into office, state spending took up 43% of GDP. By the time she left, that figure was down to...42%. Not exactly a radical change. As often happens nowadays, I find the alt-right perspectives interesting. For very personal reasons I loathed her and now find myself extremely grateful to her! I loathed her for her being, in my opinion, the root cause of the misery and penury that I endured as a 35-year-old miner during the 12 month miners’ strike of 1984-1985 and for the custodial sentence that I received just two weeks before the end of that dispute. I loathed her and her government for the post-strike unemployment that I suffered on being released from prison. In fact, after the strike had ended, I, together with a very large number of former striking miners, were blacklisted and had become unemployable in the UK. Thanks to Thatcher’s policies, I had to leave the UK in order to gain employment (as Norman Tebbit, her employment minister advised, I “got on my bike” – to Germany), which venture resulted in the widening of my horizons and my decision to enter higher education, which was partly undertaken in Germany and the Soviet Union. 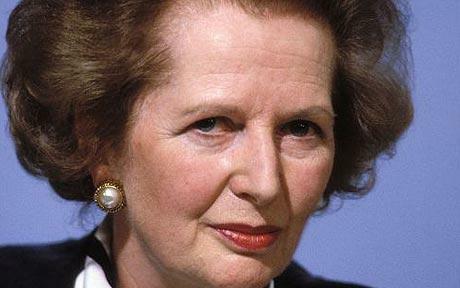 For this, I shall, therefore, be ever grateful to Thatcher. In the final analysis, then, I have Thatcher to thank for my having a wonderful Russian wife, three beautiful Russian children and peace and contentment in what the vast majority of Thatcherites would no doubt call a “mafia state” run by criminal former KGB operatives. If there had been no Thatcher and no strike; if I had continued working underground in my old workplace which had, according to a 1983 seismological survey, at least 30 years of winnable reserves, I should have probably died long before now or suffered serious injury or a debilitating industrially related illness. As regards that woman’s death: so what? She was 87. It happens to all of us. She made some right political decisions, not least, in my opinion, her choice not to abandon the Falkland Islands to Galtieri and his Junta. Unfortunately, however, her legacy will not be undone, and it is this legacy that I cannot but fail to judge negatively. The old hag didn’t have any influence in the fall of the USSR but she and her British establishment helped set up the post Russian and Russian aligned ex-Soviet states looting who the shock therapists were trained in London and British based economic institutions in Europe during the 80’s under her good friend Gorbachev who were transferring the capital to western banks in Russia to buy up Russia’s resources at a fraction of the cost the most famous of course is Lord Jacob Rothschilds YUKOS. 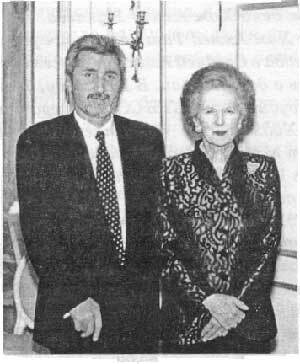 The picture I like of Maggie the best is of her standing next to the head of the Chechen mafia Khozh-Akhmed Nukhaev when they were helping ink a $3 billion Caucasus oil investment with British oil companies in London in 97. It is no coincidence the London is the centre for terrorism and Russian and other oligarchs. The coal mines were dead men walking by the 1980′s, and any British Premier would have defended the Falklands. Friendships with dictators who like you and support your policies are entirely normal and within the national interest. Funny she is most remembered for the coal miners like Murdoch was initially vilified for laying of staff workers and bring in computer printing machines but these old industries needed to be shut down or modernised to compete and become more efficient with the unions and Britain in general being notoriously socialist/left wing that has been fostered/aided by the state. I don’t think anyone in Britain seriously criticizes her for intervening in the Falklands. The interesting thing fairly recently is that its British inhabitants had a referendum if it wanted to be aligned with Britain or not that is supposed to give it some credibility yet Abkhazia did the same thing and no one took that seriously and if the Russian inhabitants of the Kuril islands did the same thing it would either be denounced or it would be seen as a provocation. Why do you loathe Gorbachev? Why do you think British coal mines of the 80s needed modernizing? British deep mining was the most technological advanced in the world. It is British mining technology that is still used world wide. The first fully automated coal face with a power loading shearer was first utilized at a colliery in my home town: that was in the late ’60s. In 1980, a ton of coal had to be won in the UK for £30 in order for a colliery to be efficient. At the same time, coal was being won in the German Federal Republic for £60 a ton in mines that enjoyed a considerably higher state subsidy than did British deep mines. Thatcher stopped the subsidies. The Germans didn’t, choosing to gradually phase out deep mining and to retrain its work force. Productivity at British mines had also been increasing year in year out when the Thatcher administration launched its long thought out and well planned attack on the mining industry in 1984. There were approximately 200 deep coal mines in the UK in that year with about 180,000 miners, whose average age (35) was the lowest on record. There are now, I believe, only 4 deep coal mines in the UK (open cast “mines” are not mines but quarries), yet the same amount of coal is at present utilized in the UK as was over 30 years ago – only it’s almost all imported now. This is the result of the energy policies of a woman who was fond of declaring that she was “batting for Britain”. She wasn’t: she was batting for own class to which she, the millionaire wife of a millionaire husband, belonged. Why do you think British coal mines of the 80s needed modernizing? Because I was suckered in by neoliberal propaganda? Anyway, I didn't know that British mining was so advanced, and that the Germans spent more on subsidies. I suppose its still true that the industry was a dead man walking - it still needed subsidies, and besides the UK had been mining huge amounts of coal since the 19th century, surely a lot of the seams will have been coming close to exhaustion - but it could have been winded down with a lot less damage and acrimony than it actually was if Thatcher had not been an ideological blowhard. Interesting I just assumed that the British coal mining industry was either an outdated source of energy although they still have coal mining firms even in the US I think and that it was lagging behind in productivity and technological innovation due to the power of trade unions who would want to keep existing jobs rather than modernise. Why do you think she demolished a vibrant national industry and resource in Britain when she fought for British interests in the Falklands? It was constantly remarked that Margret Thatcher helped destroy Britain’s industrial industry do you think this is true? I agree with all your comments about the viability of coal in the UK. Thatcher’s dispute with the National Union of Mineworkers was political, not economic. She’d served in the Heath government, which she believed had been ejected from office by the NUM. In 1984 it was payback time. I’ve not seen opinion polls, but I suspect that, at the time, more people supported Thatcher than the NUM. Of course the Tory press supported her. But even the Labour party leadership was lukewarm towards the NUM, because of Arthur Scargill’s refusal to hold a national ballot. Now, with the perspective of time, most people realise the miners had the better case, and that the human cost of the closures was terrible. In politics, you have to play the hand that’s dealt you. In 1984 Scargill had been dealt a much weaker hand than Joe Gormley had in 1972. That doesn’t change the fact that Scargill played his hand very badly. He was a gift to Thatcher. Doesn’t it suggest that the whole Attlee model of state nationalised industries had a massive glaring flaw? It tacitly assumed that all future governments would be Labour or pseudo-Labour. But when a government came to power with a determination to smash the Trades Unions, the nationalised structure actually gave them more power to do the smashing than they’d have had if the mines were privately owned. Thatcher couldn’t appoint the director of Tesco, but she could appoint Ian McGregor to the National Coal Board. The Attlee government should have made the mines into workers’ co-operatives which elected their own board of directors. There could have been a national forum in which the mines made their case for state subsidies. Curious to know your thoughts, since you have first hand experience – which I don’t. As regards your comment concerning miners' co-operatives operating pits, this is exactly what happened at Tower Colliery, South Wales, which was doomed to closure post-strike with all the rest - including, I may add, the whole of the highly profitable, and very modern mines in the Nottinghamshire coalfield, despite the majority of men choosing to work there throughout the strike because of what they deemed to be breach of democratic procedure. The fate of the Notts. coalfield absolutely nails down the Thatcherite lie that the British deep mined coal industry was shut down because of its drain on the national economy. Tower pit, on the other hand, despite being labelled by the National Coal Board as being a hopelessly uneconomic unit, went on under the men's ownership and direction to become not only profitable, but also to have some 20 years of life after the virtual cessation of deep coal mining elsewhere in the UK. That pit was worked by the men until the further working of its seams became economically non-viable. I am sure that what happened at Tower would have held true of the majority of collieries in the UK. The pit where I worked had been making huge losses in the early '80s - sunk in 1878, it had been modernised in the '50s, becoming at the time the most modern mine in the UK - because of adverse geological conditions. In 1983, I wanted to move off to the brand new, state-of-the-art Selby coalfield in order to increase my earnings, which had fallen drastically because of low bonus payments at my own pit. My manager persuaded me to stick it out at my local pit, saying that there were at least 30 years of winnable reserves there and once we had broken through the fault that was denying us access to our seams, my earnings would increase and I would be able to work there until my retirement. One year later I withdrew my labour; two years later, immediately after the end of the year-long strike the pit was closed and almost obscene haste its three shafts were capped, thereby in effect sterilizing the vast reserves of coal that are still there. And the super modern pits in the Selby coalfield were closed as well. Thatcher's attack on the NUM was a political act of pure vengeance for what had happened to her party a decade previously, a vengeance made even more despicable because of her undeniable class hatred. And the lie is still being peddled that the miners brought down the Heath government. They didn't: British voters brought down Heath, and even then the result was a hung parliament with a Labour Party government under Wilson. More specifically, it was the Ulster Unionists, who decided to ally themselves with the parliamentary Labour Party, that brought about Heath's political demise - ironically those self-same Ulster Unionists whose Irish policies gave rise to the creation of the Conservative and Unionist Party of Great Britain of which Thatcher was a member. Thatcher's dispute with the National Union of Mineworkers was political, not economic. She'd served in the Heath government, which she believed had been ejected from office by the NUM. In 1984 it was payback time. I've not seen opinion polls, but I suspect that, at the time, more people supported Thatcher than the NUM. Of course the Tory press supported her. But even the Labour party leadership was lukewarm towards the NUM, because of Arthur Scargill's refusal to hold a national ballot. Now, with the perspective of time, most people realise the miners had the better case, and that the human cost of the closures was terrible. In politics, you have to play the hand that's dealt you. In 1984 Scargill had been dealt a much weaker hand than Joe Gormley had in 1972. That doesn't change the fact that Scargill played his hand very badly. He was a gift to Thatcher. Doesn't it suggest that the whole Attlee model of state nationalised industries had a massive glaring flaw? It tacitly assumed that all future governments would be Labour or pseudo-Labour. But when a government came to power with a determination to smash the Trades Unions, the nationalised structure actually gave them more power to do the smashing than they'd have had if the mines were privately owned. Thatcher couldn't appoint the director of Tesco, but she could appoint Ian McGregor to the National Coal Board. The Attlee government should have made the mines into workers' co-operatives which elected their own board of directors. There could have been a national forum in which the mines made their case for state subsidies. Curious to know your thoughts, since you have first hand experience - which I don't. As regards your comment concerning miners’ co-operatives operating pits, this is exactly what happened at Tower Colliery, South Wales, which was doomed to closure post-strike with all the rest – including, I may add, the whole of the highly profitable, and very modern mines in the Nottinghamshire coalfield, despite the majority of men choosing to work there throughout the strike because of what they deemed to be breach of democratic procedure. The fate of the Notts. coalfield absolutely nails down the Thatcherite lie that the British deep mined coal industry was shut down because of its drain on the national economy. Tower pit, on the other hand, despite being labelled by the National Coal Board as being a hopelessly uneconomic unit, went on under the men’s ownership and direction to become not only profitable, but also to have some 20 years of life after the virtual cessation of deep coal mining elsewhere in the UK. That pit was worked by the men until the further working of its seams became economically non-viable. I am sure that what happened at Tower would have held true of the majority of collieries in the UK. The pit where I worked had been making huge losses in the early ’80s – sunk in 1878, it had been modernised in the ’50s, becoming at the time the most modern mine in the UK – because of adverse geological conditions. In 1983, I wanted to move off to the brand new, state-of-the-art Selby coalfield in order to increase my earnings, which had fallen drastically because of low bonus payments at my own pit. My manager persuaded me to stick it out at my local pit, saying that there were at least 30 years of winnable reserves there and once we had broken through the fault that was denying us access to our seams, my earnings would increase and I would be able to work there until my retirement. Thatcher’s attack on the NUM was a political act of pure vengeance for what had happened to her party a decade previously, a vengeance made even more despicable because of her undeniable class hatred. And the lie is still being peddled that the miners brought down the Heath government. They didn’t: British voters brought down Heath, and even then the result was a hung parliament with a Labour Party government under Wilson. More specifically, it was the Ulster Unionists, who decided to ally themselves with the parliamentary Labour Party, that brought about Heath’s political demise – ironically those self-same Ulster Unionists whose Irish policies gave rise to the creation of the Conservative and Unionist Party of Great Britain of which Thatcher was a member. In 1980 over 80% of UK electricity was generated at coal fired power stations. Thanks to Thatcher, 40% of UK electricity is generated that way, which, no doubt, keeps the Greens happy, but 90% of that coal used to fire present UK power stations is imported. Remember "the dash for gas" after the closure of pits? Did the price of electricity decrease after the closure of "uneconomic" deep coal mines? They're putting great faith now, I believe, in the shale-oil gas deposits that they say they have found in that very same county where I mined coal almost 30 years ago. Remember “the dash for gas” after the closure of pits? Did the price of electricity decrease after the closure of “uneconomic” deep coal mines? They’re putting great faith now, I believe, in the shale-oil gas deposits that they say they have found in that very same county where I mined coal almost 30 years ago. It is more thanks to North Sea gas that it went down to 40%. IMNSHO the conservatives would have gone nuclear if it wasn't for North Sea gas. It is more thanks to North Sea gas that it went down to 40%. IMNSHO the conservatives would have gone nuclear if it wasn’t for North Sea gas. Why do you think British coal mines of the 80s needed modernizing? British deep mining was the most technological advanced in the world. It is British mining technology that is still used world wide. The first fully automated coal face with a power loading shearer was first utilized at a colliery in my home town: that was in the late '60s. In 1980, a ton of coal had to be won in the UK for £30 in order for a colliery to be efficient. At the same time, coal was being won in the German Federal Republic for £60 a ton in mines that enjoyed a considerably higher state subsidy than did British deep mines. Thatcher stopped the subsidies. The Germans didn't, choosing to gradually phase out deep mining and to retrain its work force. There were approximately 200 deep coal mines in the UK in that year with about 180,000 miners, whose average age (35) was the lowest on record. There are now, I believe, only 4 deep coal mines in the UK (open cast "mines" are not mines but quarries), yet the same amount of coal is at present utilized in the UK as was over 30 years ago - only it's almost all imported now. This is the result of the energy policies of a woman who was fond of declaring that she was "batting for Britain". She wasn't: she was batting for own class to which she, the millionaire wife of a millionaire husband, belonged. Because I was suckered in by neoliberal propaganda? Anyway, I didn’t know that British mining was so advanced, and that the Germans spent more on subsidies. I suppose its still true that the industry was a dead man walking – it still needed subsidies, and besides the UK had been mining huge amounts of coal since the 19th century, surely a lot of the seams will have been coming close to exhaustion – but it could have been winded down with a lot less damage and acrimony than it actually was if Thatcher had not been an ideological blowhard. AK, not so very far from where you spent part of your youth in the UK they had been mining coal for at least 400 years. With the onset of the industrial revolution in the mid-18th century, south Lancashire was one of the earliest industrialized regions in the world: steam power and the railway transport revolution increased the demand for coal; shafts were sunk deeper because of the ability of steam powered pumps to overcome inundation, and of steam powered ventilation fans on the surface to help sweep the pits of firedamp, whose dangerous presence as the pits became deeper and more "fiery", was detected by the "Davy" flame safety lamp, invented at the turn of the 19th century. And the coal industry boomed. Because of the age of the coalfield and the intensity of the mining there, by the turn of the 20th century, the seams mined in Lancashire were the deepest in the world. I worked in the deepest of them all - the Arley Mine (seams are called "mines" in Lancashire and coal mines there are "pits") - at nearly a mile below ground. The shafts down which I descended to work were 920 yards deep, and from the pit bottom I had to travel almost a mile, descending to different horizons down steep inclines in order to reach the coal faces where I worked near naked because there it was as hot as the hobs of hell. Any miner will tell you that a pit has a "life": when it is young and the faces are near the pit bottom, a pit is at its most profitable; as it ages and the coal has to be hauled ever further from the faces to the pit bottom, thereby giving rise to the necessity of hiring more and more men, the profitability of the enterprise begins to decline. Mechanization was late arriving in the privately owned British mines: labour was plentiful and cheap. In the UK , coal was still mostly won with picks and shovels in my father's day - the 1930s. After nationalization in 1947, however, there was a massive investment programme for the mechanization of mining. That's why my pit, deemed a long life colliery with abundant reserves, was thoroughly modernized in 1954. Increased mechanization of the pits also led to a decrease in the workforce. The net outcome of all of this was an increase in the productivity and profitability of the UK deep mining industry. But this investment programme was long term, hence the "Plan For Coal", a tripartite agreement thrashed out between the National Coal Board, the NUM and successive British governments - including Conservative ones - that had been adhered to for 20 years or so, hence the contraction of the coal industry in the '60s: the almost exhausted and very old pits were phased out in favour of huge investment in the thick seamed coalfields of South Yorkshire and the East Midlands. That's why from the mid-'60s you could hear more and more Scots, Welsh and Geordie accents in the Nottingham coalfield: men from the "peripheral coalfields" who wanted to stay in the industry were transferred to the new "super pits", whereas the old and infirm or just simply indolent were persuaded to leave the industry thanks to attractive redundancy payments commensurate with years of service. It was this plan for coal that the Conservatives trashed in 1984. In fact, the plans to destroy the NUM and with it the state coal industry were drawn up before the Conservatives took power in 1979. This was the infamous "Ridley Plan" and economics had nothing to do with it but was used as a cover for wreaking revenge on the NUM, the "Enemy Within", just as "human rights" and "democracy" are used as a cover for US imperial policy. By the way, as regards subsidies: by far the biggest subsidised industry in the UK was and still is agriculture. the nation to ransom" though, do you? AK, not so very far from where you spent part of your youth in the UK they had been mining coal for at least 400 years. With the onset of the industrial revolution in the mid-18th century, south Lancashire was one of the earliest industrialized regions in the world: steam power and the railway transport revolution increased the demand for coal; shafts were sunk deeper because of the ability of steam powered pumps to overcome inundation, and of steam powered ventilation fans on the surface to help sweep the pits of firedamp, whose dangerous presence as the pits became deeper and more “fiery”, was detected by the “Davy” flame safety lamp, invented at the turn of the 19th century. And the coal industry boomed. Because of the age of the coalfield and the intensity of the mining there, by the turn of the 20th century, the seams mined in Lancashire were the deepest in the world. I worked in the deepest of them all – the Arley Mine (seams are called “mines” in Lancashire and coal mines there are “pits”) – at nearly a mile below ground. The shafts down which I descended to work were 920 yards deep, and from the pit bottom I had to travel almost a mile, descending to different horizons down steep inclines in order to reach the coal faces where I worked near naked because there it was as hot as the hobs of hell. Any miner will tell you that a pit has a “life”: when it is young and the faces are near the pit bottom, a pit is at its most profitable; as it ages and the coal has to be hauled ever further from the faces to the pit bottom, thereby giving rise to the necessity of hiring more and more men, the profitability of the enterprise begins to decline. Mechanization was late arriving in the privately owned British mines: labour was plentiful and cheap. In the UK , coal was still mostly won with picks and shovels in my father’s day – the 1930s. After nationalization in 1947, however, there was a massive investment programme for the mechanization of mining. That’s why my pit, deemed a long life colliery with abundant reserves, was thoroughly modernized in 1954. Increased mechanization of the pits also led to a decrease in the workforce. The net outcome of all of this was an increase in the productivity and profitability of the UK deep mining industry. But this investment programme was long term, hence the “Plan For Coal”, a tripartite agreement thrashed out between the National Coal Board, the NUM and successive British governments – including Conservative ones – that had been adhered to for 20 years or so, hence the contraction of the coal industry in the ’60s: the almost exhausted and very old pits were phased out in favour of huge investment in the thick seamed coalfields of South Yorkshire and the East Midlands. That’s why from the mid-’60s you could hear more and more Scots, Welsh and Geordie accents in the Nottingham coalfield: men from the “peripheral coalfields” who wanted to stay in the industry were transferred to the new “super pits”, whereas the old and infirm or just simply indolent were persuaded to leave the industry thanks to attractive redundancy payments commensurate with years of service. It was this plan for coal that the Conservatives trashed in 1984. In fact, the plans to destroy the NUM and with it the state coal industry were drawn up before the Conservatives took power in 1979. This was the infamous “Ridley Plan” and economics had nothing to do with it but was used as a cover for wreaking revenge on the NUM, the “Enemy Within”, just as “human rights” and “democracy” are used as a cover for US imperial policy. the nation to ransom” though, do you? Do I think it's true? I find many of the comments interesting, but especially those familiar with the English coal mining industry. I had assumed that the mines were economic, fast dwindling, and suffering from rapidly declining EROEI. Based on the comments above, it would seem that is not entirely correct and that many of the mines were either viable or close enough to viable to merit subsidies for social reasons (as in the Ruhr area). That said, from my view across the pond the British working classes DESERVED to be crushed. The preceding Callaghan Labour goverment had attempted to replace the adversarial labor relations with a more collaborative German-Scandinavian model (best epitomized by Sweden’s “Saltsjöbaden spirit”. The unions responded by creating the winter of discontent. The UK in 1979 was a half-Sovietized, dilapidated island where nothing worked. The Beatles were shocked upon arriving in America to discover that the telephones always worked. While Thatcherism was in many ways a failure, as Craig Willy has pointed out, the tall poppy syndrome and myopic, militant class hatred of the unions got a deserved come uppance from Margaret Thatcher. None of this, of course, excuses bad policies nor the failures of England’s commercial classes, who are well-known for a reticence to reinvest a firm’s working capital into new, modern machinery and prefer to rely upon antiquated Victorian Scroogenomics to increase earnings by repressing labor. As a final note, I have to disagree with Craig Willy that Thatcher was responsible for the financial excesses that came later. It was the Blair government which permitted unlimited rehypothecation which was at the heart of the world financial crisis. Thatcher’s financial reforms were largely a success and made London the global center for forex trading, overseas listings, as well as a rival for New York. And this success didn’t harm the UK manufacturing industry, which was already uncompetitive when she came to power. That said, from my view across the pond the British working classes DESERVED to be crushed. The preceding Callaghan Labour goverment had attempted to replace the adversarial labor relations with a more collaborative German-Scandinavian model (best epitomized by Sweden's “Saltsjöbaden spirit". The unions responded by creating the winter of discontent. None of this, of course, excuses bad policies nor the failures of England's commercial classes, who are well-known for a reticence to reinvest a firm's working capital into new, modern machinery and prefer to rely upon antiquated Victorian Scroogenomics to increase earnings by repressing labor. As a final note, I have to disagree with Craig Willy that Thatcher was responsible for the financial excesses that came later. It was the Blair government which permitted unlimited rehypothecation which was at the heart of the world financial crisis. Thatcher's financial reforms were largely a success and made London the global center for forex trading, overseas listings, as well as a rival for New York. And this success didn't harm the UK manufacturing industry, which was already uncompetitive when she came to power. In that biopic with Meryl Streep as Thatcher, when she receives news of the invasion, she immediately starts talking about taking action and someone points out that the British navy has been subjected to spending cuts, or something to that effect. It was the withdrawal from service of HMS Endurance that certainly gave the green light to the Galtieri regime. Thatcher used to have all the sycophant journalists in her thrall and used to bully and hector them into submission and evade answering any questions she chose not to discuss. Only once, and that was during the Falklands War, was she outmanoeuvred by an interviewer, a woman, Mrs. Gould, during a live on air debate. Thatcher’s Nemesis ‘phoned in to ask why the Belgrano had been torpedoed against all the conventions and rules laid down (Belgrano was not steaming in the declared by H.M. Government war zone) and who had given the order to sink her. Thatcher huffed and puffed, saying that the Belgrano had been in the war zone and tried to talk about her duty to protect “our boys”, but this woman persisted and wouldn’t let go. In the chair was the BBC’s Sue Lawley, who dutifully rose in defence of the prime minister, and tried to curtail Mrs. Gould’s persistent questioning. In the end, Thatcher started to appeal to authority (“I know the facts”) and told Mrs. Gould that the truth of the matter (Her Majesty’s Government’s version, that is) would be publicly disclosed in 30 years. It was good, for once, to watch Thatcher squirm. Why would she squirm? Sinking the Belgrano was awesome. It would’ve been even better if Britain had bombed and invaded mainland Argentina, though it sadly lacked such capabilities. She squirmed because she was being exposed as a liar. The Belgrano was not in the war zone and was steaming away from the Falkland Islands when the order was given to torpedo her. A lying politican, horror of horrors. Argentina started the war and Britain showed remarkable restraint in not unleashing more force. Why have a zone of exclusion at all? Why not just sink all enemy ships, military or merchant marine, on sight? Thatcher should’ve taken pride in the HMS Conqueror’s victory and called out the journalist as being an unpatriotic candyass more concerned about silly rules of war than closing with and killing the enemy.